Opening oysters takes a little experience. If you don't have an oyster knife, use one with a strong stainless steel blade. Knives not made specifically for the job may break, and metals other than stainless steel might leave the taste of metal on the oyster. 1. Mince the garlic, onion, tomato and bell pepper. Slice finely the spring onion. Set aside. 2. Heat a saucepan over a medium-low-heat. Put the butter. Add the garlic, when the garlic turns to light brown, add the onions, tomato and bell pepper. 3. Drizzle with Lee Kum Kee Sesame oil. 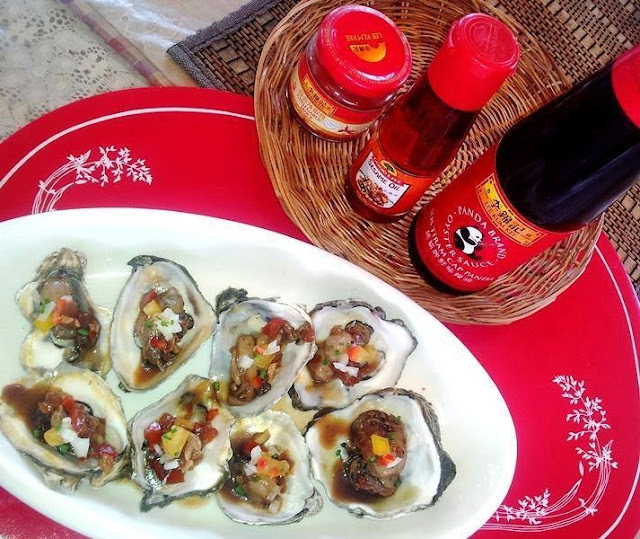 Add Lee Kum Kee Oyster Sauce and Lee Kum Kee Chili Garlic Sauce. Mix well. Set aside. 4. Rinse the oysters well. Use paring knife to open the shells. Toss the top shells. Spoon a little of the sauce into each oyster. Serve immediately.